William Pitt and Julia B. Fee Sotheby’s International Realty announced today that the company has been recognized as an Official Honoree in the real estate website category in the 20th Annual Webby Awards. The company was honored for the cutting-edge new website it launched in 2015. Hailed as the “Internet’s highest honor” by The New York Times, The Webby Awards, presented by the International Academy of Digital Arts and Sciences (IADAS), is widely recognized as the leading international award honoring excellence on the Internet. IADAS, which nominates and selects The Webby Award Winners, is comprised of web industry experts including Tumblr founder David Karp, Executive Creative Director at Refinery29 Piera Gelardi, musicians Questlove and Grimes, Head of Fashion Partnerships at Instagram Eva Chen, Twitter co-founder Biz Stone, late night television host Jimmy Kimmel and creator of the .gif file format Steve Wilhite. 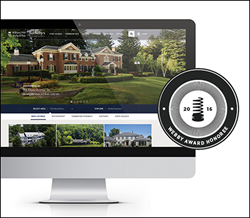 The premier real estate brokerage serving Connecticut, Westchester County, N.Y., and the Berkshires, Mass., was the only residential real estate brokerage named in the real estate website category. The company was selected from nearly 13,000 submissions from all over the world, with Official Honorees representing the top 20% of all entries. The recognition came after the company spent 18 months completely redesigning its website, launching in the summer of 2015 to immediate accolades from the trusted real estate news source REAL Trends. Describing the site as one of its “personal favorite websites with amazing integration of live listings on the homepage,” REAL Trends recognized williampitt.com as the #1 real estate site nationally in the category of Best Design, #3 in Best Mobile Experience, #3 in Best Neighborhood Pages, and #5 in Best Overall Real Estate Website. Standout features include property video clips on the home page, robust content on every listing page, full-bleed high-resolution photography, site customization according to the user’s location, the ability to custom tailor the site with personal preferences, and detailed community information and local knowledge such as accessibility to area schools and precise travel times to Grand Central in New York City. Visitors can also delve into the site’s international side, choosing from 17 languages and dialects, and converting prices into more than 50 currencies updated daily with the latest exchange rates. "We set out to create a website that offers an unparalleled experience in the real estate industry. The Webbys recognition along with our other recent accolades is a wonderful acknowledgement of that mission," said Vin Socci, Chief Operating Officer of William Pitt and Julia B. Fee Sotheby’s International Realty. “Our site not only delivers the best possible presentation for our listings, but also provides a totally unique user experience that is custom tailored to each individual real estate consumer." The website redesign was completed in tandem with a re-launch of the company’s entire online platform including its internal intranet, Agent Connect. This new solution is responsive across all devices, and was designed with the goal of making the agent experience as effortless and convenient as possible. Agent Connect provides easy and immediate access to every tool and resource a sales associate will need on a day to day basis, from editing listings to managing leads, downloading or ordering marketing materials, and enrolling in online training courses.